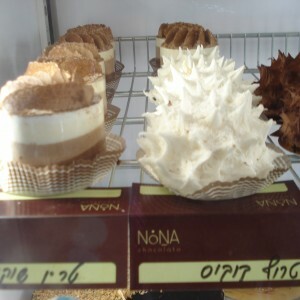 Nona Chocolate is guaranteed to sweeten and revive your day even in the height of summer. I met Eti the owner and chocolatier a couple of summers ago. 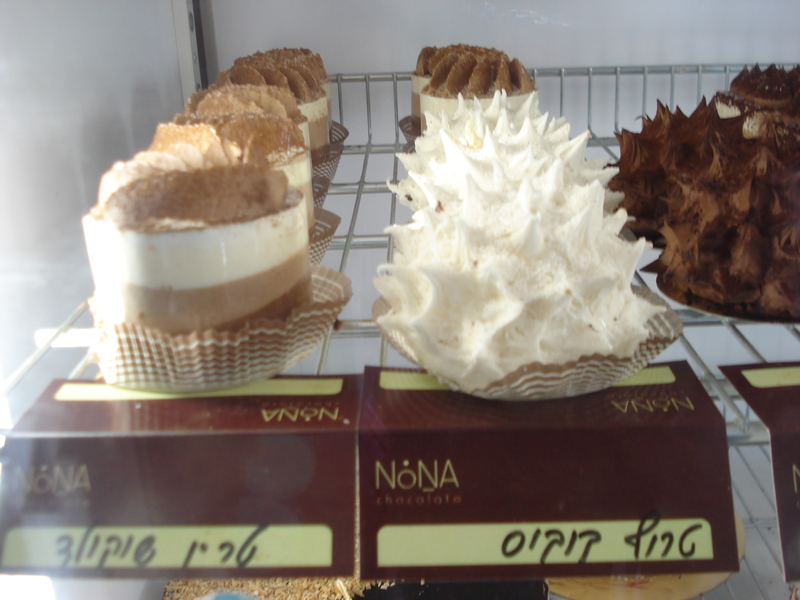 Her charming cafe is located across the street from the King David Hotel on a scrumptious piece of sidewalk. I had my eye on the place for awhile but didn’t have an opportunity to check it out. It’s a picturesque spot with round stone tables and brown and white wicker bistro chairs inside and out. Eti’s chocolate shop is on an elegant street around the corner from some of Jerusalem’s most exclusive silver smiths and hotels. I stopped by one quiet afternoon while my kids were in Ulpan. Eti was inside ladling freshly whipped cream into a customer’s pot of velvety brown hot chocolate. I had some time, so I began to look around. First up are tasty and gorgeous ruffles and ganaches and tarts and mouse cakes, triple layered, single layered, as well as cakes of sizes and creams of all colors. As customers were leaving, Eti and I began talking, and I was extremely surprised and moved by what she revealed. What I subsequently learned gave new meaning to bittersweet. Eti used to be a grief counselor for soldiers while she served in the Israeli Army. A recent terrorist attack near her shop brought her out of her kitchen and back into her former line of work. You wouldn’t know it, but the previous week, an Arab construction worker used a small bulldozer to raize half a street on his way toward the King David Hotel. Shaken from the drama but committed to staying put, Eti did what she does best: talk and feed people. Things were quieter and back to business when I met Eti. The damage to the street across from the King David Hotel was cleaned and cleared and her patrons were stopping by as usual. These are the kinds of stories that wake you up from your own thoughts and worries. I came back several times to talk to Eti and sample her chocolate creations. She and her shop continue to thrive on this coveted stretch of pavement and her desserts and homemade crepes continue to sweeten the day. ← Spotlight on Modi’in: Ancient Birthplace of the Maccabees.